Albion boss Chris Hughton spoke to the press this afternoon ahead of Saturday's Premier League match with Fulham. 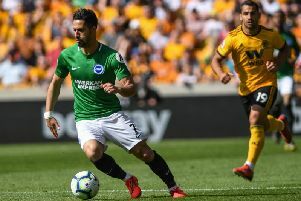 He was asked about the latest team news, whether Albion can better last season, how to stop Aleksandar Mitrovic and more. "Andone and Izquierdo, we're very hopeful they will be available after the international break. "Bruno has trained the last couple of days, so it would be a decision on him. At this moment, Lewis Dunk hasn't trained but we're hoping he's going to train tomorrow. We haven't ruled him out." "There's good competition between Bissouma and the midfield players we've got, as you would like to think there's good competiton right throughout the squad. "We're a little bit lighter than we'd like to be with some of the injuries but the reason we brought in the players we did in the summer is because we felt it would give us a stronger squad and a stronger squad means more competition. "There's not direct competition. Saturday's game (at Liverpool) was more about the formation I wanted to play and the type of game I wanted to play, which affected the personnel. "I'd like to think we've got good competition right throughout the squad." Can Bissouma and Gross play in the same team? "Yes, certainly they can. What we have with Bissouma is a young lad, he's a very talented individual. "We saw midweek the qualities he's got, as we did on Saturday. But sometimes it takes a little while to adjust, to the language, the way we play, the way he's used to playing. Can they both play in the same team? Yes they can. "What we have in the midfield group is different ways of playing, different combinations we can have and I'm quite sure we'll use them combinations through the season." Next four - Fulham, Southampton, Tottenham, Manchester City - is there extra pressure on the Fulham game? "There's pressure on all games but yes, going into the international break knowing you won't be playing for a couple of weeks and for us that little bit longer because we play Southampton on the Monday night. "There is always a better feel going into the international break knowing you're on the back of a good result. "We had a wonderful result in our last game at home. "Any extra pressure going into games is one you welcome. We will do everything we can to try to win. We are at home and will try to work on our best elements. "Any pressure that comes with it, you have to welcome." "They are a side who spent big in the summer. They've recruited really well. Most, if not all of the players they brought in, we knew and our recruitment department would be well aware of them. "They've brought in very good players. "They've been unfortunate in two games. I saw them play at Wembley against Tottenham and in any game Tottenham can create chances but they were very much in the game. "They showed their real quality in their last game and they are a team who can score goals. "They haven't changed their style too much from last season, which gives them continuity in what they do and you know the type of game they want to play. "I've been impressed with the signings they've made." How do you stop in-form Mitrovic? "It's the same with any player in form. It's not just about stopping one individual, it's making sure you have a good enough foothold in the game that enables him to not have the service. "He's started the season very well and has had the continuity from last season and he feels very much at home there. "We will have to make sure we stop the supply to him because we know how dangerous he is." "When a player gets older, you don't know how long they can keep that level of pace, that level of enthusiasm and that level of desire, it has to come from within. "That's why every player is different. One player at 32 perhaps might have come to the end of his career, another one and we have one in Bruno who is 37 - he is playing no different now to ten years ago. "Glenn has a great desire to want to play and play as long as possible and thankfully for us he has a great desire to score goals." Have you grown in the Premier League? "You can only gauge that by games. If we take the midweek game against Southampton, there were a lot of aspects I was very happy with. "We changed the side, we had some young players playing, some players playing out of position and overall I was delighted. "You can only gauge by performances and if we look at our three games in the league, we are on the back of two very good performances against Manchester United and probably even more so up at Liverpool. "To come close showed our levels and in the last couple of games, we've been able to raise that level and hopefully use that experience." Can you better last season? "You're always very wary and conscious because what I've also seen is three teams who have come up, two inparticular have spent big money. "If anything this will perhaps be a more challenging season than last season. "Every team is conscious of Stoke going down last season, a West Brom going down last season and a Swansea going down - arguably three teams people didn't expect to go down. "Everybody is more conscious and wary of how difficult this league is. "At the moment we're on the back of two good performances. "What we have learned is our levels have to be somewhere like that to get results." "We've had four games and four different captains. It's not a bad thing, it shares the responsibility around the squad and gives them a feel of what we think about their leadership qualities. "If you haven't been captain for your club and you're given it, it's a great honour." Schelotto and Towell heading out on loan? "Possibly but we don't know. "Particulary Richie Towell, there has been that interest and we're quite sure there will be a fair bit of business today and tomorrow for individuals. "Whether they're our individuals or not, we don't know but certainly it will be a busy day for a lot of the Football League clubs as today and tomorrow is their only opportunity."